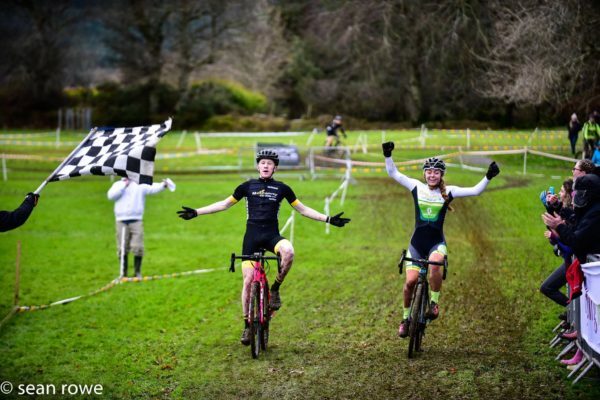 Irish cycling’s Lara Gillespie: The 16-year-old is competing in both hockey and running yet still won the elite cyclocross crown today in Co Wicklow. Above, she takes the win alongside Thomas Creighton who was winning the junior men’s race. 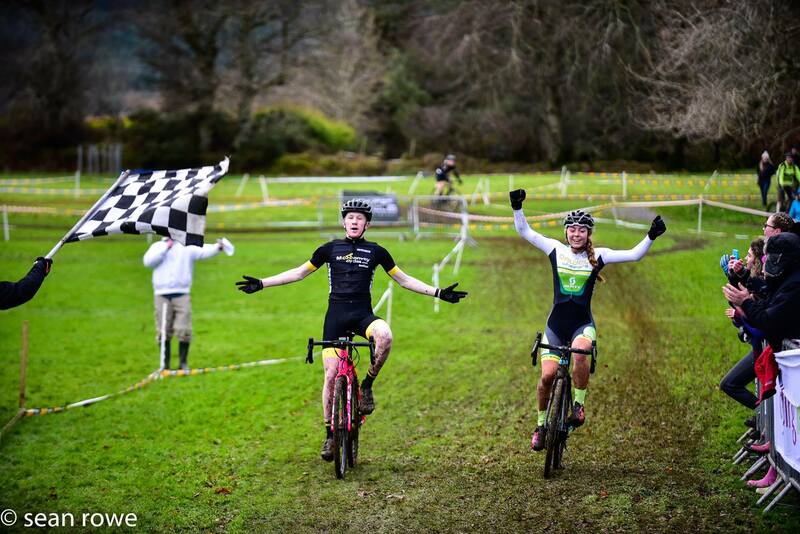 They both arrived at the finish line at exactly the same time to make for a great shot by Sean Rowe. Still only 16-years-old, Orwell Wheeler Lara Gillespie is celebrating her first national elite title. She has already looked like one of Ireland’s most promising young riders in recent years. But her elite national cyclocross victory today truly announced her arrival. Incredible as it might sound, Gillespie has been focussed on playing hockey more than cycling in recent months. She won all of Irish cycling’s U16 road and track titles on offer last year; six in total. She’s also a former U12 and U14 national triathlon champion. A strong soccer player, she has previously spent time with the Leinster development team. And this year she will continue playing hockey with her school team Wesley College. Gillespie also has a date at the schools world cross country running championships in coming months. Uppermost in her mind before today’s cyclocross showdown was a nasty collission on the hockey field in recent days when she sustained a leg injury. The Co Wicklow fifth year student was hoping that would not impact on her performance on the bike. And thankfully it didn’t’; the teenager powering to victory in Glencullen Adventure Park. It is her first elite national title. And if cycling doesn’t lose her to any of the other sports she still has a hand in, more medals lay ahead. “I’m chuffed, really I am; over the moon,” she replied when stickybottle asked how it felt to win today. 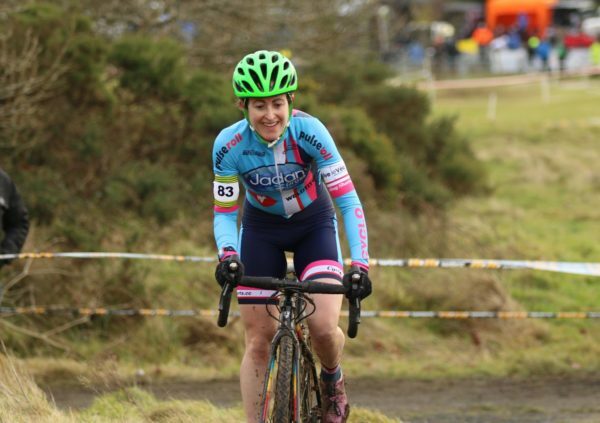 Despite winning on numerous occasions during the current cyclocross season, she says she didn’t expect to come away with elite gold. Today’s women’s race was pencilled in as four or five laps, depending on the pace. Gillespie felt a four-lap event would suit her better, so she did her best not to add to the pace early on. Sure enough, with two laps completed the women were told they had two more to go. And from that point it was ‘game on’ for Gillespie. “Maria (Larkin) went the strongest at the start and I was a little bit behind,” she said. “Some of the riders then ran up the hill on the course and I rode up it. That meant I was ahead early; but I didn’t really want to be. Gillespie then stayed near the head of affairs for the next 1½ laps. And on the third circuit of four she found herself leading with eventual silver medallist Michelle Geoghegan (Team Jadan-Weldtite). “We were side by side; neither of us really wanted to be in front. So I just took the lead but wanted to keep the pace easy and wait for the last lap. “I didn’t mind if it was going to go down to a sprint; I just wasn’t going all out. “And then Michelle went into the pits when I probably should have too,” she said of the final lap. “I was in a rhythm and I didn’t want to change that. “When she was in the pits something went wrong for her and she had to run a bit up the hill. I cycled up it and got another gap. Riding up the climb when others ran it proved the key point. And Gillespie said when she got a gap of around 80 metres on Geoghegan on the last lap her confidence grew. She was caught by Thomas Creighton (McConvey Cycles) at the finish; an unusual turn of events. He was leading the junior men’s race, which went off two minutes ahead of the elite women. Creighton caught all the women and passed them, getting up to Gillespie on the line. It meant they both sailed over the finish line side by side to take their gold medals. Gillespie laughed that when she saw Creighton taking both hands off the bars for a two-handed victory salute she had to do the same. 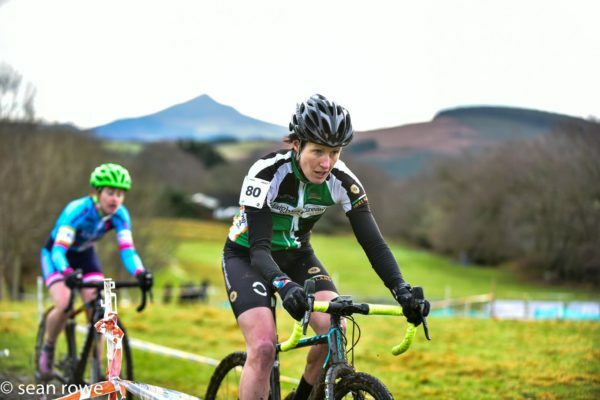 Gillespie said she had been supported by a huge number of people in cycling including Martin O’Loughlin, Orla Hendron, Andy Layhe, Robyn Seymour, Pi Cycles and her club. Given that she is playing hockey “five days a week”, her win today bodes very well. She had always enjoyed mountain biking from an early age. And while she took national titles in triathlon, she only joined a cycling club in 2016. She took silver in underage championships that year. And last year she rode Rás Mayo “really hoping to do well”. She won the opening two stages; a TT and road race. However, a crash on the third stage proved a major blow. Gillespie had been hoping for selection for the European Youth Olympic Festival in Hungary. And her crash ruled her out as she broke her elbow. Or so she thought. She managed to secure a wildcard entry to the Youth Olympics after all. And in the TT won the silver medal; a Majorca training camp proving invaluable in the lead-up. Looking ahead, today’s ride may secure her a ride at the World Cyclocross Championships next month. The road and track Worlds and Europeans are also possible this year. 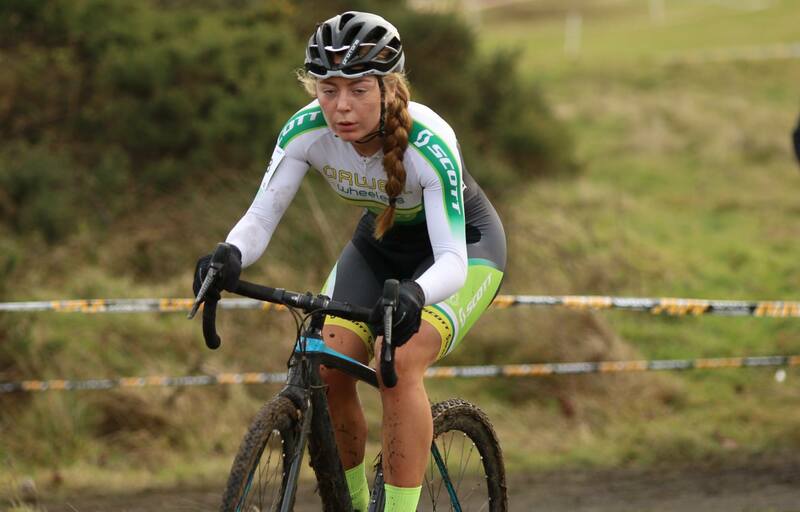 Her three road and three track titles – not to mention her U16 cyclocross title – last year certainly underline her versatility.